The Vilenica 2015 Slovene Author in Focus is the writer, poet, and playwright Milan Jesih, whose poems express artistic sensitivity and are always filled with an undulating magic of language. He is set to appear at several festival events. A translation of a volume of his poetry to English by Nada Grošelj titled Selected Poems is scheduled to be published by the American Dalkey Acrhive Press as part of its Slovene Literature Series. 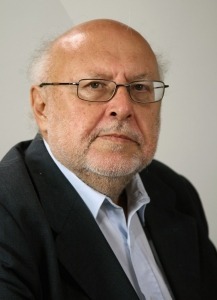 Milan Jesih was born in 1950 in Ljubljana. He began to write poems and attempts at dialogues while still in high school. He studied Comparative Literature at the Faculty of Arts at the University of Ljubljana for four years and published his first book in 1972. He worked as a freelance artist from 1973 until his retirement in 2013. He writes, poems, plays for children, puppet plays, plays for theatre, and plays for radio and TV. He translates particularly for the theatre (mainly from English and Russian), mostly the classics, such as Shakespeare, Ostrovsky, Chekhov, Bulgakov, Gorky, Babel, Kleist, and Nušić.